Stubborn creases can be removed from clothing in no time, with this 2400W steam iron. The Sunbeam Verve 62 Platinum Iron SR6250 features a powerful, 80g, Extreme Steam Shot function which, when activated, produces a high-pressure steam shot from the tip of the Teflon Platinum Pro soleplate. 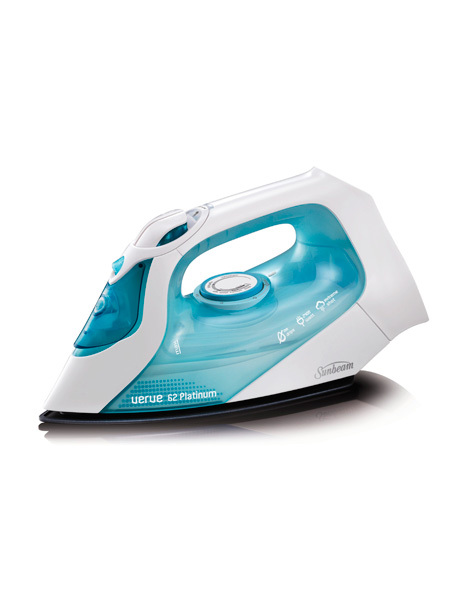 This iron also has a continuous steam output of 38g/min and its water tank has a capacity of 300ml. It features anti-calc and drip-stop systems, a fine spray function and heats up quickly. Includes 24 month replacement warranty.